Package Detail: Individual PE foam and carton box for each screen, 5-10 boxes per wooden case. Color Titanium gold, rose gold, champagne gold, coffee, brown, bronze, brass, wine red, purple, sapphire, Ti-black, wooden, marble, texture, etc. 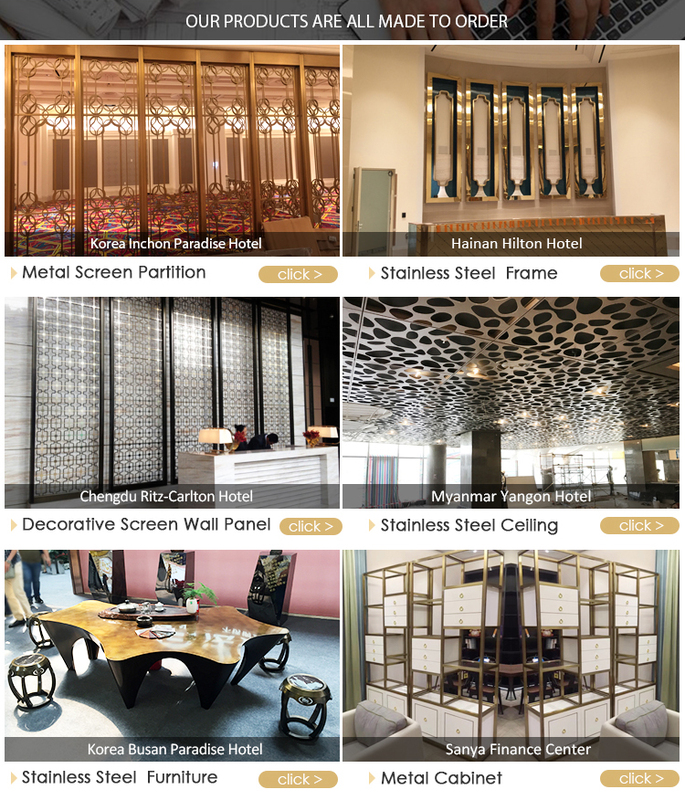 Finish HL, No.4, 6k/8k/10k mirror, vibration, sandblasted, linen, etching, embossed, anti-fingerprint, etc. 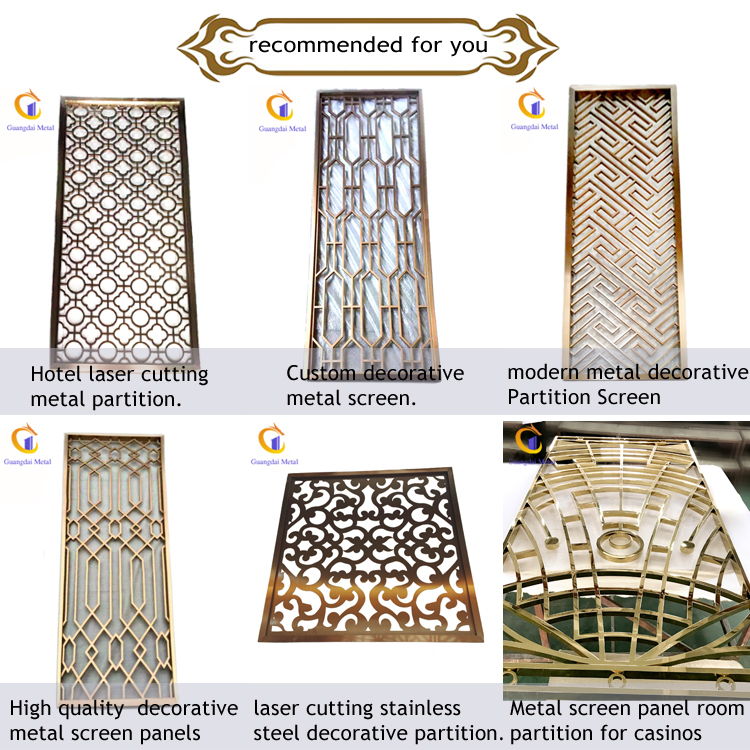 1,The metal screen partitions are perfect for the home, hotel, restaurant, bar, cafeteria or store. It not only decorate your place but also separate your place naturally. 2,It separate or distinguish 2 sections within that space, or to provide a chic, decorative focus point within the room. Alternatively, room dividers can also be used to provide a private area in an otherwise open space, screen off an unseemly area. 3,What’s more, room dividers provide an easy solution to so many household problems. Quick product selection, CLICK below keywords to view all of our products. 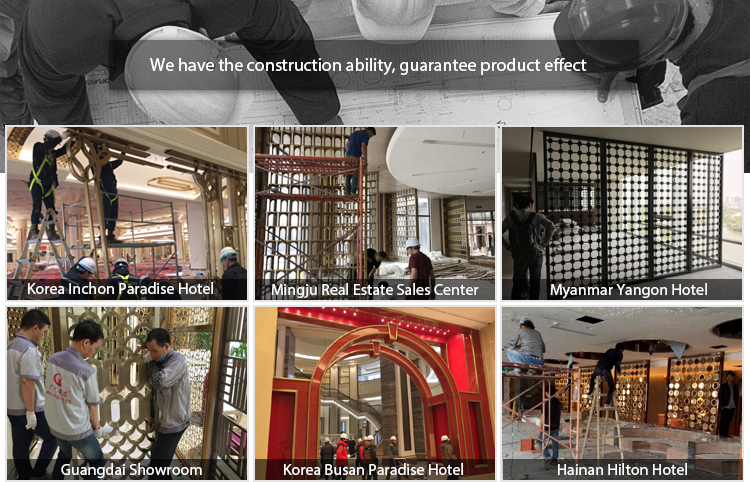 Succeed in 1,000+ large scale engineering projects since established, deluxe star-hotel, villa, real-estate cases take over 3/4. 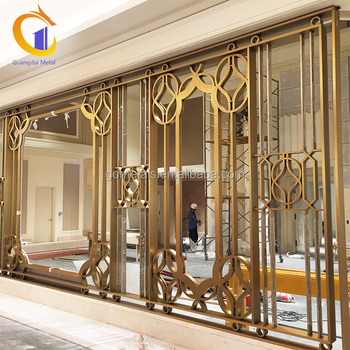 Metal Screen is widely used in star hotel, private villa, luxury apartment, office building, gymnasium, karaoke, night-club, casino, art-park, modern museum, exhibition hall, noble residence, and any other deluxe placements. Q1. How to place an order? A 1. Usually, it’s based on your design drawing or original sample. We offer you relative technical proposals with good quotation, then we begin our production against our mutual agreement. Q2. Can you send me your products catalog with price list? A 2. E-Catalog of showing products style is available to offer for your reference. Since specific items results in varies rate, pls kindly inquiry us with your detailed item. Q3. How about your delivery? A 3. Generally, sample is within 5~10 days, bulk order is within 15~45 days but subject to final confirmation. Q4. How do you pack our items? A 4. Your items will be well packed by sea-worthy export standard wooden package, or by customized. Q5. 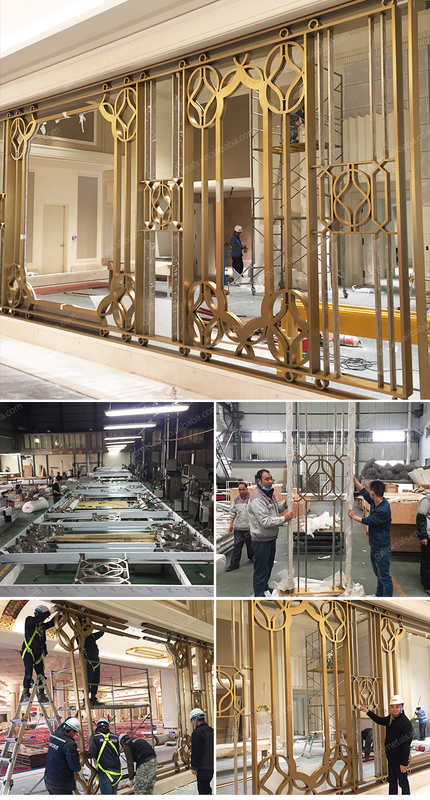 How long can you guarantee for the product and its finish? A 5. 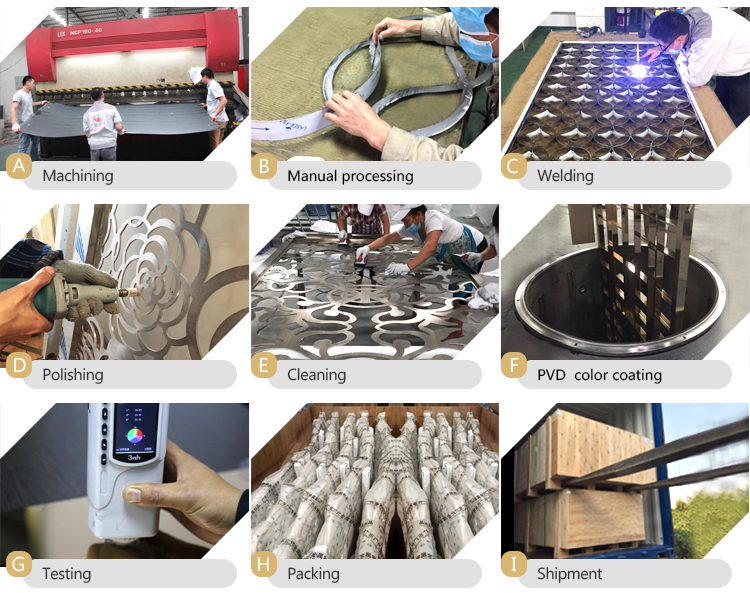 Finish guarantee for 20 years, and stainless steel materials’ Quality Certificate can be provided. Q6. What’s your price term and payment term? A 6. Price term: EXW, FOB, FCA, CFR, CPT, CIF, CIP, etc. Payment term: Available by Cash, T/T or L/C. Deposit for bulk production is required. Installment payment for engineer project shall be negotiated.